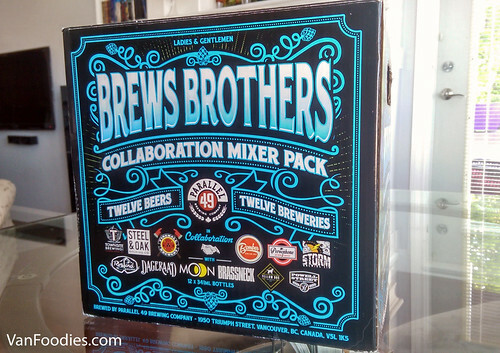 For today’s post, my good friend Colin (of Impossibrew) and I decided to collaboratively drink the Brews Brothers Collaboration Mixer Pack recently released by Parallel 49. 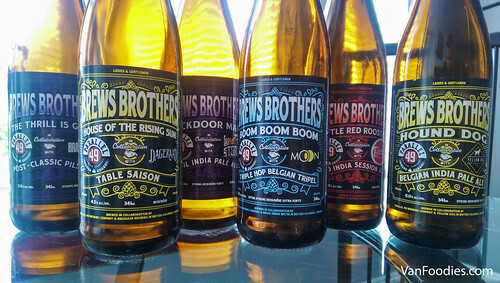 We also consider ourselves Brews Bros of a sort, so it seemed fitting. Colin – Definitely not very funky. Lacking in body, I think. It’s not often you get a saison that’s 4.5%, which explains the lack of body. There’s basically no hop profile. Actually, that might be why it’s called a table saison and not just a saison. Bryan – I feel like it’s good but not great. It has a bit of subtle spiciness to it and the basic saison flavours. It does what it needs to be good but it’s almost afraid to get out and try something crazy to differentiate itself. Colin – The atomic elements of a saison are there, but it’s missing what you would expect to make it great. Like a session IPA. All steak and no sizzle, baby. This is a starter beer. You might go out and mow the lawn, and then come back in and drink this beer. Bryan – Yes! Which makes it a good choice for us to start off with. Colin – That’s not bad. There’s actually a surprising amount of flavour there. Bryan – Truthfully, I’m enjoying this more than I did the first time too. There’s more hop than I remember. Colin – I’m impressed how full the malt profile is, considering it’s a session ale. Bryan – I have to change my expectations with session ales. I know it’s wrong to judge a style based on another style, but I’m still adjusting to it. I keep waiting for a session that doesn’t sacrifice anything in terms of flavour. This seems to come as close as any I’ve tried. Bryan – Dirty jokes aside, prepare yourself to be slapped in the face by a heavily spiced Italian dish. Bryan – What? Really? You aren’t German, you’re Italian. I’m going to start calling you Mario. Colin – Hah! What’s nice is that the base beer is really good. It’s a really good amount of hops and bitterness. And it balances really well with the basil, this is something I would definitely drink again. Bryan – You know what, Storm does their own Basil IPA. I wonder what the difference is between the solo version and this collaboration version? Colin – That would be an interesting experiment! I’d like to try that. Bryan – For sure. But as is, this is a great beer. There’s a lot of basil, but I’m totally OK with that. Makes it different, but in a good way. James makes a lot of crazy beer and he knows how to balance it. In general, it’s all up to taste, of course. Some stuff might be too much, but I’m almost always a fan of amping up flavours so I’m totally down with it. Colin – You know what, now that it’s warming up a little bit. I change my mind, this is just the right amount of basil. I don’t want more now. Enter your email address so you will get an email when we have a new post! Starbucks Canada Black Sesame Tea Latte – Tastes Like BBT? Starbucks Canada Black Sesame Tea Latte - Tastes Like BBT?